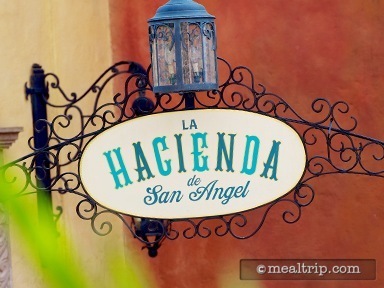 Colorful globe lamps and star lanterns dot the ceiling of La Hacienda de San Angel while tall windows offer a great view of the World Showplace Lagoon. Authentic Mexican cuisine is featured, with house-made corn tortillas and fresh salsas being made each day for the various entrees. Popular appetizers include a taco sampler, roasted sweet peppers and a queso fundido dish, while entrees range from grilled tilapia and achiote marinated chicken, to Fried shrimp tacos and braised short ribs with chile de árbol sauce. 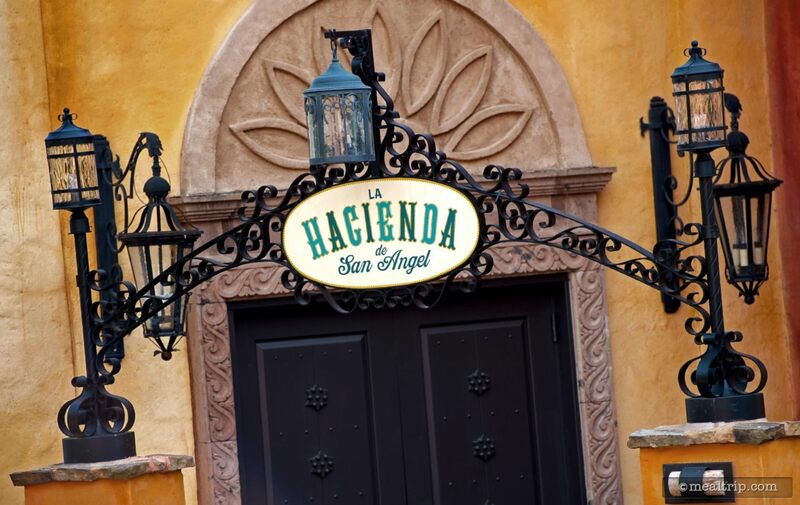 Two platter entrees (made for two) are also available, the Parrillada "La Hacienda" features New York strip, chicken al pastor, chorizo and vegetables, while the Parrillada Del Mar offers shrimp, fish, scallops and vegetables. Both platters are served with beans and fresh salsas. Desserts such as the Empanada de Manzana (an apple and caramel filled puff pastry) and several ice cream, sorbet, and mousse selections are available. In addition to the standard beverage offerings, there are quite a few original Margarita’s on the menu, including a Mango Blueberry Basil Margarita and the Orange Mango Fire Margarita. Imported and domestic beers, and Tequila flights are also available.